This is one of my favorite pastimes. I love creating handmade gifts, cards, wrappers, and whatnot. I also love taking things apart and creating something new out of them. Aside from writing, it’s my greatest form of self expression. Here’s something that kept me busy this week: handmade crafts meant for swapping. I haven’t blogged about anything that has to do with crafts these past months because honestly, I wasn’t inspired to work on anything new and so this year’s craft projects were limited to handmade cards and creative giftwrapping for a few chosen friends. Last week, I chanced upon a Mail Swap invite from Hey Kessy. I immediately signed up for it because I saw it as an opportunity to get motivated on a new project. Besides, I love receiving snail mails, especially parcels with anything handmade. Inspiration from HERE. I chose this design since here in the Philippines, the rainy season comes after summer, but instead of rainshowers, I opted to scatter flowers. The clouds and umbrella were manually cut out, while the flowers are craft-punched. The border is quilling paper. I personally do not know my recipient so I chose showers of hello, which are printed out, for my text. I left the card’s message board blank, but I did embellish it with stationery paper and craft-punched flowers. At the back, I cut out a flower and stuck a sticker of MEMENTO by Milai. After I finished my card, I was stumped on what else to include in my parcel, but I got an idea of working on a notepad when I saw my store-bought notepad in the office. Here’s how I made it: First, I halved about 25 pieces of intermediate pad paper length-wise. The front and back covers were folder cut outs. I then glued the pad’s spine using Elmer’s Multi Purpose Spray Adhesive. Once everything has set, I worked on the front page’s design. I cut out newspaper pieces and mod podged them over the front and back covers. The letters were stamped and colored using Sharpie pens, the flowers using Pilot Color Eno mechanical pencils. As I have always associated summer with flowers, I also included floral-themed gift tag sets. I cut out different gift tag shapes on board paper then craft-punched some flower and butterflies that I packaged individually using recycled packets from craft supply stores. The colorful floral gift tags are wrapper cut-outs. The text TO: and FROM: are stamped. I then placed everything in a pink-and-white store-bought gift bag, punched in 2 holes and added a dark pink crochet thread as its ribbon. The gift tag is handmade, accessorized with washi tape. The text is handwritten using Dong-A MyGel pen in neon pink. I also added scrapbook and card borders in assorted design and colors. I didn’t realize until now just how many punchers I have until I worked on this project! Once done, I placed them in a handmade envelope with a Martha Stewart Flower Bed Deep Edge Punch. The BORDERS label is stamped while the flower on its flap is a wrapper cut-out. When I went over my partner’s Instagram page, I noticed that she loves reading books so I decided to add some handmade bookmarks in my parcel. I made 4. The Wish it… one was the easiest to make since it’s just stamped over white bond paper then glued on pink cardstock. The border was made using a dark pink Sharpie pen while the black ribbon was recycled from a clothing label’s price tag. The Life Is Good bookmark is also stamped, and I just made it colourful using Sharpie pens (my favorite craft pens, by the way). I used a pair of zigzag scissors to emphasize the cut then traced the lines using a Pilot G-Tec brown pen. I bought a Crop-a-Dile when I visited Chicago and just recently, learned how fun it is to use in setting eyelets, which was what I did for this bookmark. The tag/ribbon is braided abaca (Manila hemp) strands. The pink flower bookmark with a purple sequin at its center was made using paper cut outs. The tag is made of pink raffia. The personalized Julie bookmark has a recycled carton for its base that I just colored and bordered with violet Cray-Pas Expressionist oil pastel. The butterfly stamp is from Hero’s Three Artistic Butterflies woodblock set. I stamped it over a magazine article then smothered it with Mod Podge Sparkle. I just love its ribbon with dainty pink and white flowers! Of course, this wouldn’t be a mail swap if I did not include anything letter-related so I composed a one-page letter explaining why I included this and that in my parcel. I just hope she can read it because my handwriting has always been small and my choice in pens since college has always been Pilot G-Tec C-4 or C-3, which further emphasizes my minute handwriting. Add that to the narrow spacing of my stationery, and everything’s just as cute as a button. Te he. By the way, my stationery of choice was not handmade. I used Hallmark’s, which has an accompanying envelope. I stamped it with stamp-looking clear stamps I found in Daiso (a Japanese novelty store) and added the recipient’s name using stationery leftovers, letters from a magazine, and craft-punched flowers with glitters. The Via Air Mail stamp on its flap was from another stamp set from Papemelroti (it’s from the same set as the letters with flowers). I know how parcel contents sometimes get dislodged so I decided to pack everything in a recycled brown Manila envelope. I just re-sized it to 6 x 11, the required parcel size then added borders and whatnot. My border was simply an imitation of an Air Mail envelope’s border. I used red and blue Sharpie pens to achieve this look. The “stamps” are actually cut-outs from pages of my travel-inspired notebook. Since I do not have scissors that will create a stamp’s usual edging, I used a regular one-hole punch and carefully snipped along the edges. Voila! Pseudo-stamps! On the back portion, I added a wide band of pink paper with floral border and handmade papers made from magazine cut-outs. I actually did this to hide creases since they are the only signs that the envelope was recycled. There. All done and sent out. Now I’m excited to receive my mail! This entry was posted in Crafts and tagged Handmade Bookmarks, Handmade Cards, Handmade Notepad, Mail Swap on July 7, 2014 by milai. My first attempt at 3-D quilling. The pot is quilled. So are the flowers, with the green and dark blue ones made using the fringe technique. I glued each flower on sticks then carefully arranged them. I used dark blue, light blue and white sand to cover the base of the sticks and give weight to this entire creation. The leaves are craft-punched using Martha Stewart Craft Punch – Frond. 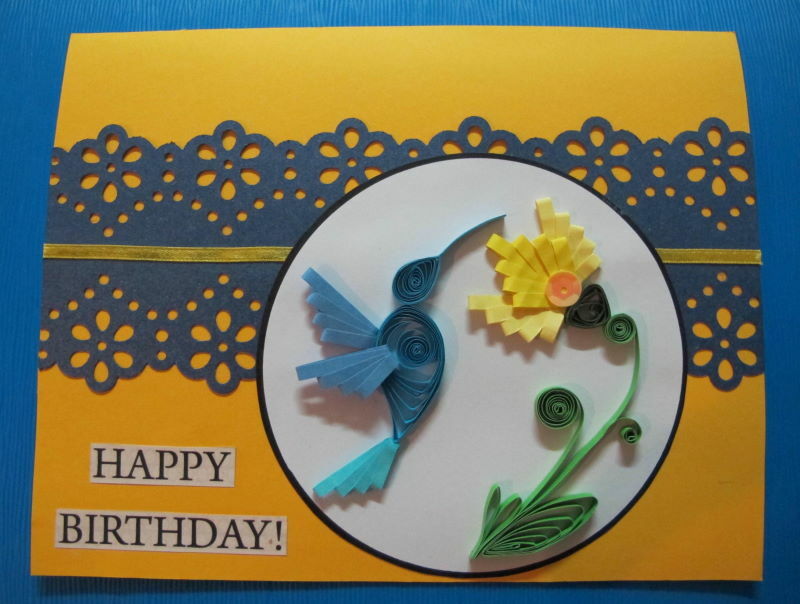 This entry was posted in Crafts and tagged Quilling on August 26, 2013 by milai. I wrapped this gift in haste so except for the handpainted wrapper, this was really very easy and quick to do. Wrapper: Since I do not have a plain green wrapper big enough to cover my big box, I painted a sheet of Manila paper and sprinkled some green glitter glue over it. Gift Tag: A Hallmark bookmark that I tied to the gift using an elastic gold thread. This was the tricky part since it took me maybe eight (8) times to tie, untie and re-tie the ribbon before I got satisfied with its look. I even had to knot it twice to keep it from slipping. Accent: Buttons in various shapes and in pink, green and yellow color scheme to compliment the bookmark. This entry was posted in Crafts and tagged Giftwrapping on July 4, 2013 by milai.